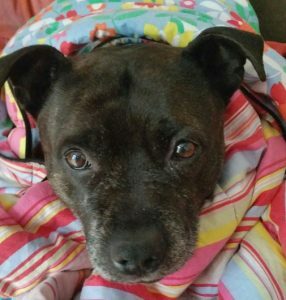 This cute little boy is Tucker, a 9-10 year old Staffy. He was found as a stray and taken in by Newport City Dogs Home, where everyone loved him but no one was able to adopt him. Oldies Club were happy to be able to help. 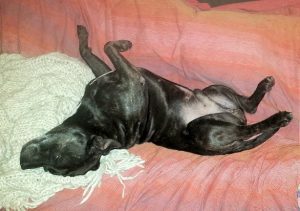 He’s now in a lovely Oldies Club foster home in Hampshire while he waits for a permanent home. 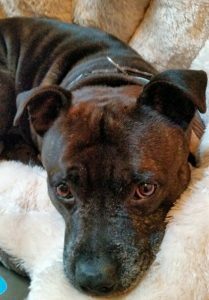 A relaxed boy in foster: He did not take long to settle into his foster home and soon recognised the daily routine: when snooze time was, when food came and in what order and when the children came home from school. As you can see, he figured out when and where to relax too! Loves company: Tucker needs a home where he can be with someone most of the time. His foster carer is gradually getting him used to being alone for a short time but leaves him with a friend when she has to go out to do boring human things. Good with calm dogs: Actually, Tucker loves all other dogs but they sometimes find him a bit boisterous. It doesn’t occur to him that other dogs might find him alarming or annoying. He’ll bound right up to them and try to play! He calms down quite quickly after some hello sniffing. He would enjoy living with other friendly dogs. It’s thought he’d be happiest as one of two, or one of four but less so as one of three, because he needs to feel included in everything. Unknown with cats: Tucker hasn’t been cat tested but doesn’t show much prey drive with small furries in the park. 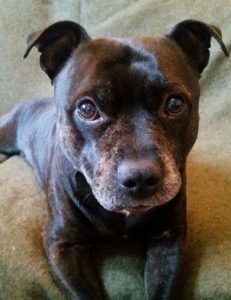 Older children only: Tucker is too excitable to live with small children because he loves people so much but is built like a little tank. He can also get carried away when playing and sometimes be a bit mouthy. His foster carer is training him out of this habit and he’s taken to that training very well. He responds to a calm but firm “No”. He walks past children calmly when out on walks but in the home, he’ll always be too exuberant for anyone small or unsteady. He’s relaxed most of the time but at play times and during greetings, he finds it hard to contain himself! Loves walkies: At the moment, Tucker has two half hour walks a day or one longer one. He would gladly do more though! Anytime you want a stroll, he’ll be right there with you. If you want a lazy day, one good walk will do, as long as you have some play time with him too. He’s easy to please. OK in the car: Like most things in life, Tucker finds car rides very exciting! This might settle down with practice. He calms down after a while and it helps to have him in one of those car safety harnesses that plugs into the seatbelt socket, restricting bounciness. Tucker’s favourite pastimes: There’s a long list of things Tucker loves… belly rubs (sometimes when he gets excited that he is getting a belly rub he falls off the sofa! 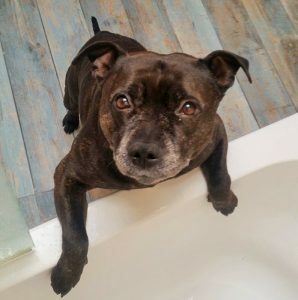 ), back rubs, neck scratches, snuggling, rolling around, meeting new people and dogs, walks, exploring, playing tug of war and (probably the most funny to watch) he loves catching the water from the shower head in his mouth! Tucker’s dislikes: Being picked up, being left alone and The Vet, but he likes the Veterinary nurses when they’re on reception! Tucker’s ideal home: An active household where someone will be with him most of the time. He’s very sociable, so having more than one person or plenty of visitors would be nice for him. He’d like to live with another dog(s) or at least be able to meet and play with some. A garden for charging about in would be good and he will need some grass to roll in, of course! Health notes: Tucker is neutered, vaccinated and worm/flea treated. He has a dry, itchy skin problem but it’s clearing up nicely. His back legs can be a bit stiff sometimes, after he’s been lying down. 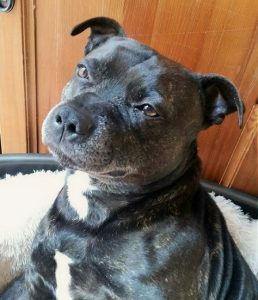 His foster carer says: “He is a really charming gentleman to have in the house. He has stopped the nibbling that he was doing when he arrived here, apart from if he is over excited by a visitor. He stops as soon as he is asked. He is full of life and would benefit from an active house but not with small children because when he rushes around and might knock small ones over. He is happy to live with other dogs and there has been no food aggression at all. He has made us all laugh and has so much love to give! 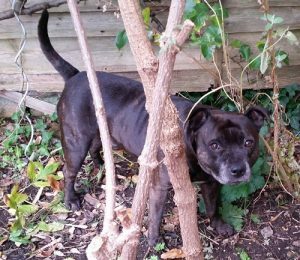 Tucker can be rehomed anywhere on the UK mainland, subject to a satisfactory home visit, but note that you will be required to travel to the foster home to meet him.